We drink it with a nice dinner. We covet it after a long day. When we gather for a celebration, it always finds its way to the table. Yes, we’re talking about wine. Wine is the center of happiness. It relaxes our mind and brings smiles to faces. Beyond the mental happiness, drinking alcohol can be good for your physical health when it comes to moderate wine consumption. We’ve all heard that a glass of wine here and there is good for you, but how exactly does it contribute to your health? The ways seem almost endless. New studies appear to be constantly backing up the health benefits of drinking wine for moderate drinkers. 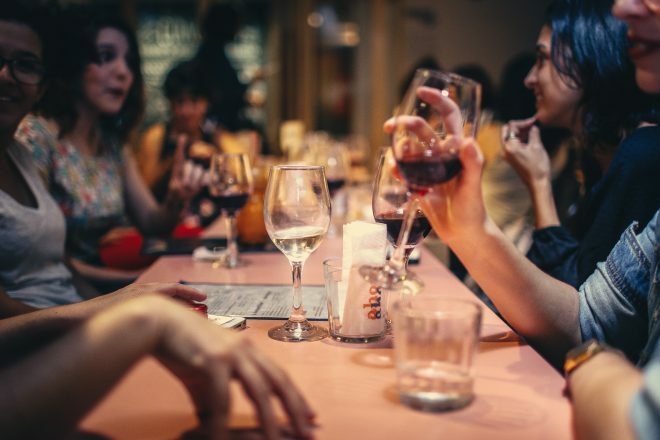 From decreased mortality rate to attacking cancer cells, a little wine at the end of the day can go a long way when it comes to beneficial effect. Before we talk health benefits though, let’s talk pour size. It can be hard to gauge what an appropriate pour size is given the varying sizes and shapes of wine glasses. While we may love our oversized wine glasses, medical experts don’t consider that a proper pour. A proper glass of wine is a 5-ounce pour. And when we say “moderate drinking”, that means what is clinically considered to be healthy. For women, it’s one glass a day and for men it’s two – I know ladies, we get the short end of the stick. Wish more meant better, but that’s life. Now that we got that straightened out, let’s get to the fun part. Pour yourself a glass, and take a look at the ten ways wine benefits your health.